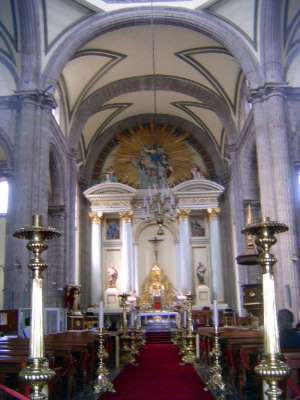 When Rodriguez moved inside, however, he switched styles from Baroque to neoclassical, which at least had the advantage of creating an interior that echoed the interior of the cathedral. The altar was from another hand, Pedro Patiño Ixtolinque, who was the protégé of Manuel Tolsá, who had added the clock to the cathedral facade. Terry laments that "the church was repaired and redecorated in 1908, and in the unhappy rage for restoration it was despoiled of most of its best adornments."